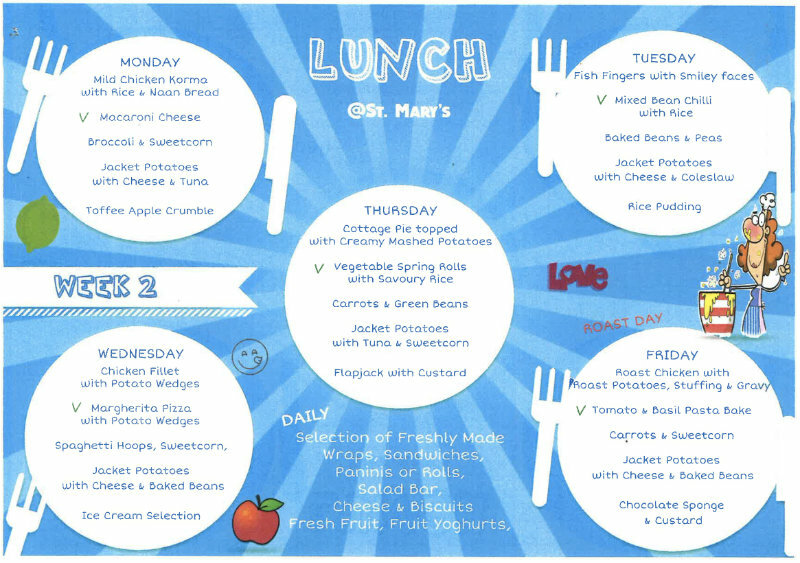 At St. Mary’s we run our own school kitchens which offers us a greater degree of flexibility in deciding what food we serve to the children. However, we do also have to adhere to a set of food standards. 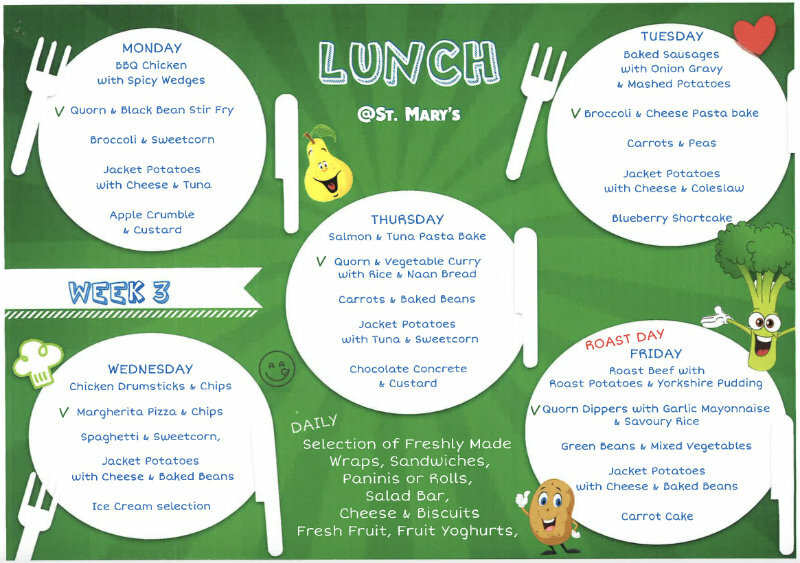 In May 2006, the Government announced new standards for school food. There were in three parts to be phased in by September 2008 in primary schools. 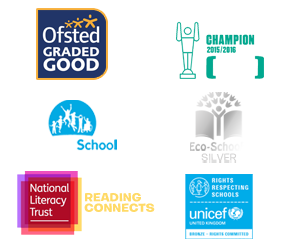 Together they cover all food sold or served in schools: breakfast, lunch and after school meals, tuck shops, vending, mid-morning break and after school clubs. 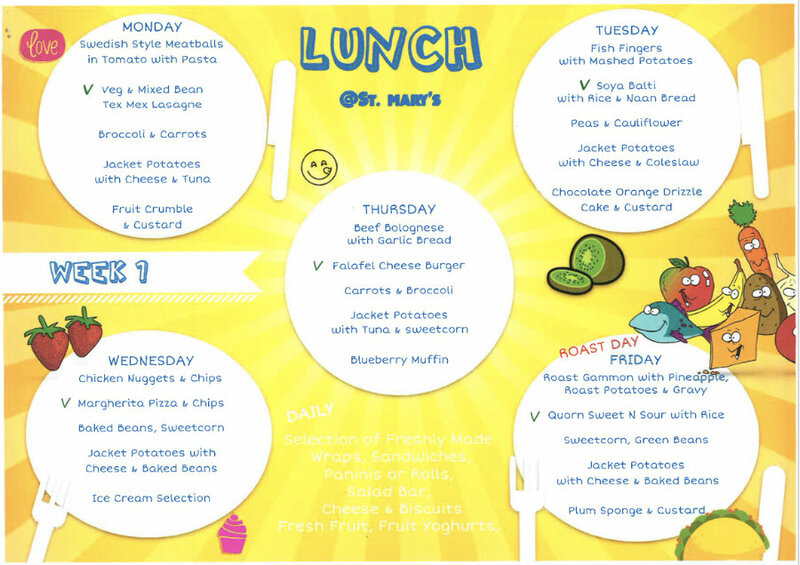 Menus must include daily not less than two portions of fruit and vegetables. Fish must be on the menu once a week and oily fish included once every three weeks. A food from the starch food group must be available and in addition to this a type of bread with no added fat or oil must be provided daily. A food from the milk and dairy food group should be available on a daily basis. Fat or oil must not be used in the cooking process on more than three days in any week. For every day that a starchy food cooked in fat or oil is provided, a starch food not cooked in fat or oil should also be provided. A meat product from each of the following four groups may be provided no more than once per fortnight providing the meat product also meets the standards for minimum meat content. Group 1- Burgers, Hamburgers, chopped meats, corned beef. Group 2- Sausages, chipolatas, sausage meat, and luncheon meat. Group 3- Sausage rolls, meat pasties, and pork pie. Group 4-Any other shaped or coated meat product. Red meat must be provided at least twice a week, a dairy source of protein may be provided in place of meat, fish and other non-dairy sources of protein. The menus should not contain more than two deep-fried food in a single week. This includes products that are deep-fried in the cooking or manufacturing process. Condiments such as tomato sauce, salad cream, mayonnaise should only be available in portions of not more than 10g. A fruit based dessert with a content of at least 50% fruit measured by weight of the raw ingredients must be available at least twice a week. No chocolates, sweets and crisps can be sold in school. Chocolate and chocolate coated products (excluding cocoa powder used in chocolate cakes and icing) cannot be served in school. 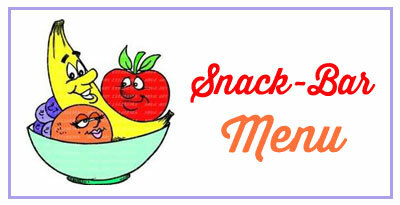 No snacks may be provided except nuts, seeds, fruit or vegetables with no added salt, sugar or fat. Drinks – Only water, milk, pure fruit juices, drinks made from the previous three drinks and low calorie hot chocolate and milk shakes that contain less than 5% added sugar. Salt must not be made available on tables to pupils. Free, fresh drinking water must be provided.